A leading strategy for managing the ongoing pandemic of Fusarium wilt in bananas is the generation of resistant banana varieties. To gain insight into the diversity of the causal fungi, Nani Maryani Martawi looked to the Indonesian archipelago, where hundreds of wild and cultivated banana varieties are grown. As part of her PhD research, she studied the diversity of the isolated pathogens that cause Fusarium wilt and their co-evolution with the banana hosts. Fusarium wilt, also known as Panama disease, has wiped out thousands of hectares of banana crops around the world. It is caused by a soil-borne fungal pathogen Fusarium oxysporum f.sp. cubense (Foc), which can best be managed by developing resistant banana varieties. In her dissertation, Nani Maryani Martawi introduces comprehensive studies on the genetic diversity and phylogeny of Foc strains associated with Fusarium wilt. Using cluster analyses of Indonesian and global isolates, she revealed the widest genotypic diversity ever reported for Fusarium wilt of bananas. More than half of the genotypes ever identified were present in Indonesia, suggesting that these banana pathogens co-evolved with the local banana varieties. Martawi also provides convincing evidence that the Foc Tropical Race 4 (TR4) strain, which kills the Cavendish cultivar, likely emerged from Indonesia and is still evolving alongside local varieties. 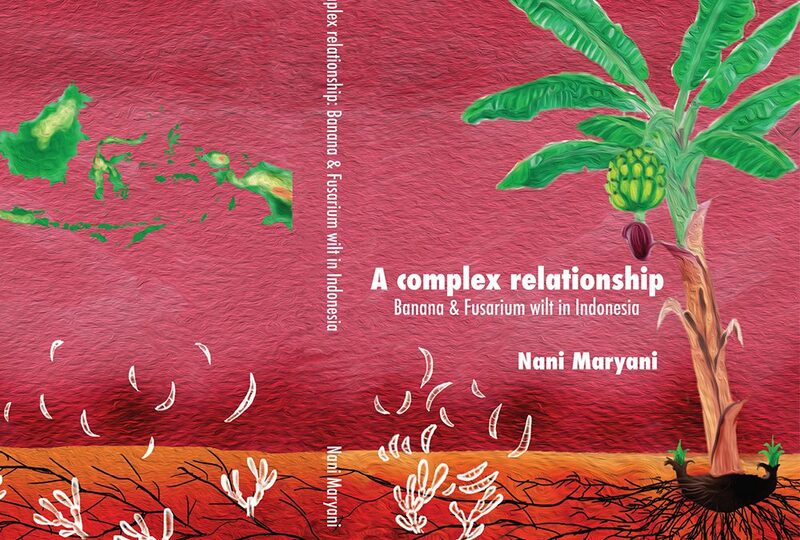 Nani Maryani Martawi defended her dissertation entitled ‘A complex relationship: banana and Fusarium wilt in Indonesia’ on 29 October 2018 at Wageningen University. For information about Fusarium wilt in general, click here.